This volunteer opportunity is for groups only! 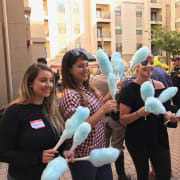 Corporate or Community Groups can sign up for this opportunity to host an event at one of our affordable housing sites located all throughout California. Build community and brighten the holidays by planning a party for our children and their families: decorating, hosting games and crafts, and serving food. These events are generally hosted during regular business hours, and we cannot host groups over the weekend. We also ask that the groups plan the event (with staff support and input) and bring any needed supplies (although we generally have some supplies onsite). For events in the past we have hosted groups who've led parties with treats, games, arts and crafts projects. We will work with you to design and plan a fun and interactive event! Volunteer group will plan and host an event geared for youth living onsite. Purchase any decorations or supplies needed for activities, raffles, etc. Set the tables and serve food. Build community-sit and talk with children and their families and engage with them. Clean and clear community space on site, pack up all items brought. Must have excellent interpersonal skills, organizational skills, and a positive personality and demeanor. Able to approach and welcome all types of people. Volunteer groups will have the opportunity to work closely together to problem solve, be creative and execute a fun event, spend time with new people, and help provide a fun experience to low-income seniors or families.